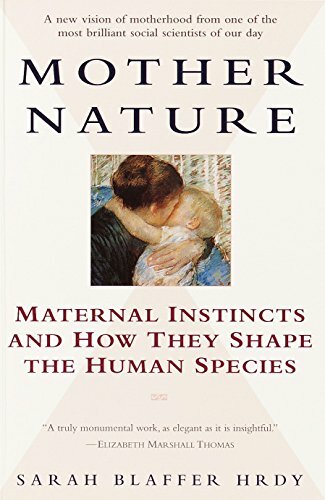 I started to wonder just how much what we understand about mothering and, more specifically, attachment parenting, stems from limited observations of mothers in cages. These animal mothers were given pretty much no choice but to sit around nurturing their children. They didn't have to fight for survival (gathering food, fending off other animals) or jockey for position among their own group (against males or against other females). And they also weren't given any help or interaction from other members of their group when it came to rearing their young, such as might have been seen in their natural environment. And in my culture — middle-class, white, U.S., urban residential — as I'm sure in many of yours as well — I do sometimes feel just as isolated as those lab rats in their sterile enclosures. We're tucked away and brought up not to rely on other relatives, neighbors, or friends for childrearing. Even if we asked, they've been brought up not to offer, or to feel confused or out of their depth or even offended at the request. I'm talking not just occasional babysitting here, but day-in, day-out coparenting. Humans, as "cooperative breeders," have evolved to expect that sort of long-term assistance, and it's a huge challenge for one woman to parent by herself as our independence-minded western culture now expects of her. Our babies take a looong time to mature, and that's where having other trusted hands around gives them the stability and care they need while at the same time giving the gestational mother time to pursue her own needs and desires for work, rest, play, and connection. So we're up against the expectations from these limited laboratory experiments that we'll sit around docilely nurturing our young by ourselves all day — but we really can't, given our much more complex environments (our necessities of breadwinning and social navigation, among others) — and we really don't want to, given our biological and anthropological expectations and very real human desires, needs, and dreams. I've always found it strange that western culture expects a woman to essentially bring up their children with no support but then again I grew up in a large extended family with some alternate views on family life. I have always thought that the tribal way of the family/village helping to raise the child makes much more sense both for parent and child. Also, Mother Nature sounds like a very interesting book. I love this book. I found it absolutely riveting and incredibly challenging. I was incredibly impressed by how rigorous the research is. But, since you haven't finished it yet, I feel bound to compelled to warn readers - it requires a very strong stomach at times. To the point where I don't usually recommend it to new moms. The chapters on infanticide, wet-nursing, gender preferances, and 18th and 19th century "foundling homes" (where most babies died quickly) were VERY HARD TO TAKE. But, going back to your post, one of the things I loved best about this book was the way that she challenges the all-consuming attachment parenting norm (along with any other norm you can think of), painting mothers as free agents, making difficult choices for their own and their childrens' survival. It's the darker and far more realistic big sister to "Our Babies, Ourselves." @Kitty: Yes! The tribal/community model just makes so much more sense. I'm envious of you for your extended family experience! @Michelle: I should have read Orgasmic Birth before my last birth. I'll try to get to it still! :) The spanking book definitely sounds intriguing. @Inder-ific: That's a good warning to put in there — thanks. I did expect that it would contain that sort of thing, what with all the animal deaths so far, but forgot to warn anyone. I'm a sort of true crime buff so have been fascinated/repelled by instances of infanticide in the western world. I don't mean fascinated in a good way — I mean I can't wrap my head around it, and it hurts trying. So I'm hoping this book will shed some light on those aspects of mothering (without just freaking me out). But, yes, as to your second comment, that's what I appreciate so far, too. That mothers are individuals confronted by circumstances and are not monolithic. It's the darker and far more realistic big sister to "Our Babies, Ourselves." — that's a great description. I think you know how much I love love love Hrdy's work! The BEST book I could have read within the first year of the Critter's birth. Any excuse I have to feel guilty about something, I certainly take it up, and, as we know, mothering is the mother lode of guilt. So I credit Hrdy for saving me from a lot of guilt. I second Inder-ific's warning about some of those middle chapters. They were so distressing that I actually couldn't read them then and haven't ventured to go back to them now. And also, when you're finished with Mother Nature, you must must must read Mothers and Others! Sounds like a fascinating book and look forward to hearing more from your review. I continuously dream of a more consciously created village environment to raise my kids. I find it so wierd to have to balance all of their needs with all of mine plus house, hubby, and all the rest that life throws in each window of 24 hours, mostly alone. I'm already lining up a rota of friends with particular skills to send my kids to for lessons - herbalists, yoga teacher, photographer, farmer etc so they can get a broader experience of life that I can offer alone...I'm digressing here...was just sparked by the post so far. For me, the need for a "tribe" to help raise my child(ren) alleviates most of the ambivalence I have of working and sending my daughter to daycare. In a perfect world I would work part time and share child care with a friend more equally. But, in our society hiring a daycare to take on some of the child rearing is the next best thing. @Rachael @ The Variegated Life: Well, just reading (in the page 200s now — go, me) one of the precursors to the infanticide chapters describing male warriors practicing infanticide pretty much icked me out. So, yes. And I second the idea of being saved from mother guilt. It's so prevalent, and it's nice to get a dash of common sense from this book about how what we're trying to do, alone as parents and/or as working parents, is HARD. @Terri: Love that idea of intentionally creating a village community! Second thought to Terri! :) I'll need to consider that for unschooling. It sounds perfect! @Olivia: Exactly! Daycare isn't perfect, but it's not always possible to have the ideal. I have that same ambivalence over our daycare/preschool choice. @Michelle: That is really interesting. Have you written any about that experience and your subsequent thoughts? But, inspired by your post, I am reading Mothers and Others now. And loving it. I loved this post so much I'd like to share it in my own blog! This is the first time ive felt that way about a post or had an urge to share another's post on my blog-so how do I go about doing that? I mean is it rude? I just credit Hobo Mama and back link To the orginal right?